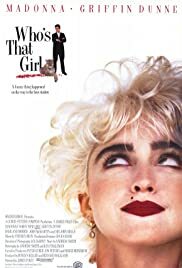 Music video for the Madonna single from the film and soundtrack of 'Who's That Girl'. Four years unjustly jailed haven't dampened the spirits or determination of Nikki Finn (Madonna). The spunky parolee sets out to clear her name, and sets the Big Apple spinning in deliriously funny ways. Nikki Finn: Cops stop me, they find Johnny in a lot of pieces in the back of my car. Judge called it a "crime of passion." Nikki Finn: [slight pause] Hey, I liked Johnny, but not enough to kill him. There was so much bad press when this movie was released that I avoided it with all cost. Just the other day I was in a video store that was showing it over their monitors and the few minutes I caught seemed really funny so I rented it. To my surprise, I thought this was one of the funniest movies I have ever seen. I mean it's a completely silly, screwball comedy, just what I would expect from such a movie. I don't get why most people hated it, I laughed from beginning to end. I am a big fan of Bringing Up Baby and What's Up Doc and in my humble opinion this fits right in with those two. As for Madonna, I'm a fan of her music, especially the last two CD's but feel she is sort of stiff on screen. I feel her best performances were in Evita and A League of Their Own and I would now add Who's that Girl? to this list. She comes across very natural and you can tell she's having a blast with this character. Give this movie a chance. Most stores rent it for a buck and if you really don't like then turn it off, but don't be surprised if you find yourself viewing a guilty pleasure.